Well, it's been a while since the last post (again). Somehow, the summer months are not the best for me to blog. I've been busy with gardening, enjoying my days off, running, doing lots of things or just doing nothing at all. In the meantime finished my Clinical instructor course and having a few weeks off right now and ... I'm knitting again. Today I'd like to discuss a great and simple method for stranded knitting. I've been knitting for many years now, but one thing I've never tried is stranded or fair isle knitting. Have you? My recent, first attempt to (a rather simple, 2-color) stranded knitting was a disaster. I couldn't keep the right tension, didn't know where to keep the yarn and at the end of the day I didn't enjoy the whole experience at all. Sounds familiar? Then I remembered that Ingrid from the Couturette blog posted a link on a Ravelry a while ago, in a discussion panel during the Knit for Victory challenge. Though the spoken comment in video was in German I thought at the time that the images were quite clear. It had a quite interesting, but very clear and logical approach by knitting every row in two takes: once with the contrast color yarn and then with the main color yarn. No fuzzing with the different color yarns and I must say, the results looked great! you knit every row twice, first with the contrast color yarn, then with the main color yarn. you need to knit the matching stitches of your pattern and just slip the stitches of the other color without knitting. remember, you only need to twist the yarns at the end/beginning of the rows! It might seem a lot at first sight, but trust me, once you get started it makes sense! 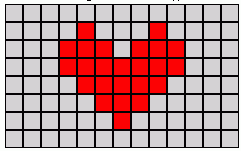 For a first attempt I'd suggest to knit a simple, symmetrical pattern, like the little hearts I used. That way it is easy to track back which color to use, especially when working with the yarn overs on the wrong side. - you have to knit every row twice which takes more time than the traditional method for stranded knitting THOUGH: I don't count slipped stitches and yarn overs as time consuming and watching your tension and loops at the back is time consuming as well imo, if you are not experienced in stranded knitting.